I guess we are all just car guys Chris, it helps you always have good threads with nice updates. Luckily it's all A OK at present - I'm especially enjoying the V8. Will post some more car info soon. Although I was hoping my next update would be on the Daimler! So were we Chris, so were we. I have to say that every time I hear of a volcano in Wisbech, this is the first thread I check. Bit of a "Bad news" update on the Mercedes. I came to the car on Saturday afternoon and noticed a tyre was a little low, so I topped it up. I rechecked the tyre on Sunday morning, and was disappointed to see it had lost around 1 Bar overnight. So I have been promising myself I would get to the tyre shop to get it checked out; today was the day I finally managed to duck out of work and action the plan. But this is where it gets a bit more difficult, because a brand new rim is £750.00 and used ones are like rocking horse dung. I've seen a few rears on Ebay for a couple of hundred quid (the rears are wider than the fronts), but no fronts. A bit more research and it turns out this type of AMG allow wheel (the AMG III) is notorious for cracking over pot-holes. So front ones hardly ever come up for sale. 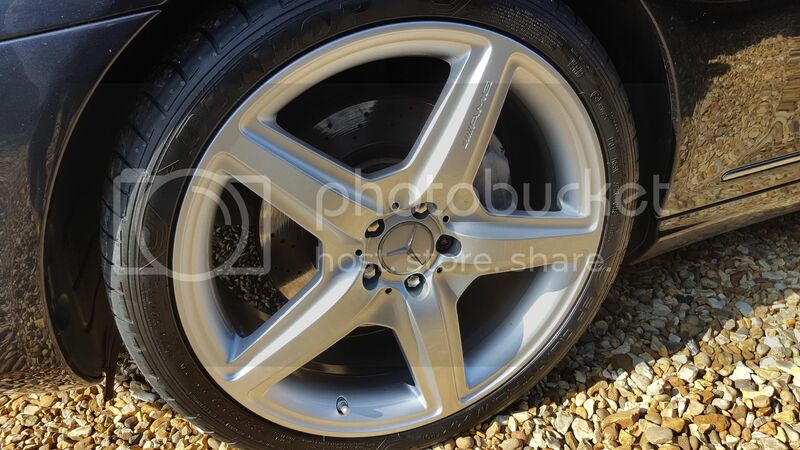 I've found a full set, refurbished for £950.00, so I could just buy these and sell the wheels I don't want. Or I can buy a set of brand new aftermarket wheels and fit my tyres on to them. The front tyres are brand new so I don't want to waste them. This is what they look like (but it is the opposite side, drivers side, that is cracked). Thanks Alfie - I've not checked Mercedes forums yet. It will be deciding which aftermarket design to go with if I do, I am a stickler for an OEM look; although I know some aftermarket wheels look just like the originals. What kind of crack are we talking about?! If going down aftermarket route, the only ones I can think of without looking gash are Brabus Monoblocks- very expensive. Cheap wheels are best avoided imo.